In a bowl, combine the flours, baking powder, baking soda, salt and sugar. Add eggs, buttermilk, vanilla and melted butter. Stir to just combine. The batter should be slightly lumpy (small lumps). Let the batter sit for at least 10-15 minutes before cooking. I cook these on a grill at 275 degrees. They’re best cooked at a medium heat for a little longer than you would regular pancakes. Scoop about 1/3 cup batter for each pancake. 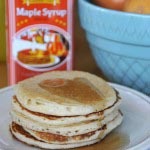 Pancakes are ready to flip when the top of each pancake is spotted with bubbles and some of the bubbles have popped.